John Carpenter and Alan Howarth's classic They Live score is being reissued once again. Despite already re-releasing the soundtrack to the 1988 flick back in 2013 and again in 2014, Death Waltz is dusting off the album for yet another deluxe vinyl reissue. As Mondo/Death Waltz revealed on their social media channels this week, the new They Live reissue will be out on January 30. The 2019 edition will come with newly revamped artwork designed by Alan Hynes, which plays up the film's truth-exposing sunglasses and subliminal messaging. 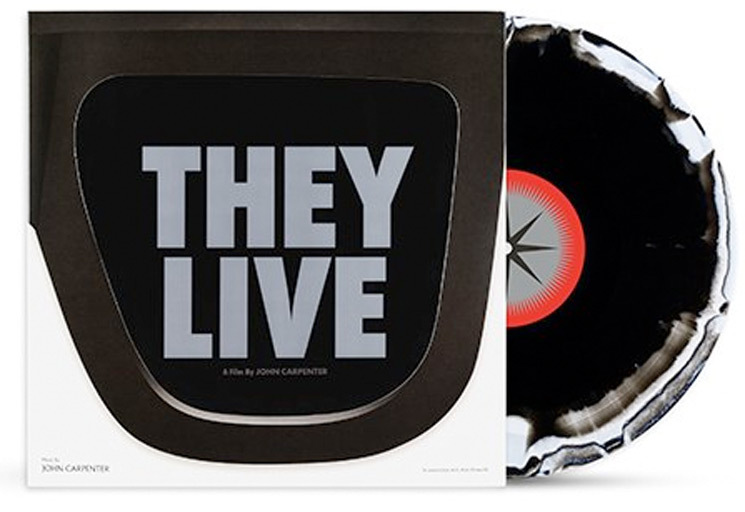 There are also several fancy coloured vinyl variants, including a "Buy More Records" picture disc variant that was exclusively available through Mondo's They Live screening last night (January 16) in Austin, London, Los Angeles and New York. The other two colour variants include a "Annihilation of Consciousness" version and "Formaldehyde Face" version, both of which will be exclusive to the Mondo webstore. However, brick and mortar retail stores will likely also get supplied with yet some other variant, probably plain old black (which we all know sounds best anyway). As for the actual music, the 2019 They Live pressing seems to mirror that of the previous Death Waltz pressings, meaning it will not include the massive amount of bonus tracks included on the rather awesome 20th anniversary reissue from 2008 done by Alan Howarth. If you need some convincing to buy more records, Mondo/Death Waltz have put together a purposely retro promo clip — bubblegum and all — for the reissue, and you can watch that below. The new reissue comes in the wake of the recently released book They Live: A Visual and Cultural Awakening. Hear John Carpenter's "Halloween Triumphant"